As anyone that reads this blog on a regular basis knows I have a large soft spot in my heart for Thailand’s national symbol, the Asian elephant. Tourists to the kingdom will come into contact with these beautiful beasts many times throughout their travels, from Bangkok to Issan the elephant plays an important part in the tourism economy. Unfortunately most tourists don’t realize they are the sole support system for this industry of enslavement. From being hit by speeding vehicles to being electrocuted by low hanging electrical wires these gentle giants have to persevere rough city streets and sometimes less than friendly mahouts to help earn their masters money. It’s a sad life and not one any animal should have to endure. Not long ago a baby elephant was being led out into the Bangkok streets to begin his long night of work when he fell through a large storm grate and became trapped. The poor beast remained trapped for over 12 hours while many men worked to free it. The psychological harm done to these animals can be just as severe as the physical harm done to them. Aside from the elephants that walk the streets of the major tourist cities you will also find elephants at most of the major attractions in Thailand such as animal parks, Zoo’s and gardens. Elephant rides are a huge tourist draw but again these elephants endure the same unnatural working conditions and sometimes cruelty to perform as they do. Most elephants in the tourism industry begin their life in small cages as babies where they are prodded with sharp sticks and metal hooks to train them to perform correctly. These Elephants once trained make it into the tourism industry from street begging to the higher ranks of playing soccer or painting pictures for you. Fortunately there are people like Sangduen “Lek” Chailert and the Elephant Nature Foundation who have devoted their lives to this cause and are doing wonderful work that you, the tourist or expat, can take part in and feel good about. Lek’s love for the Asian elephant began as a child when her grandfather, a traditional healer, saved a mans life and was given a baby elephant as payment. That baby elephant, named Tongkum, would change her life. She found that the human relationship with the elephants could easily be forged through love, kindness and rewards rather than cruel training procedures. After going to college in Chiang Mai and earning her bachelors degree she went to work in the elephant tourism industry helping elephant trekking companies locate and secure available elephants. It was then that she discovered the darker side of the domestic elephant trade through the abuse and neglect she witnessed. Lek then began her new career as an advocate for the domestic and wild elephants of Thailand to change the traditional ways and help to educate not only the tourists but the elephant owners as well. Through this passion the Elephant nature Foundation, a non profit charity, was born. Lek had sold everything she owned and used the profits from her travel agency to rescue elephants and and start the Elephant Nature Park in 1996. In 2003 an American wildlife charity bought and donated a 16 hectare site to the foundation where over 30 elephants live and roam today. The elephant park is a place where you can not only see the Asian elephant in their natural habitat but you can also learn more about these gentle giants and volunteer your time to help preserve this way of life for them. A visit to the park can be a full day excursion, an over night stay and even a three week stay if you wish, you will not only learn about the Asian elephant but will also be actively helping the park to maintain and promote awareness to the plight of the Asian elephant. The cost of every visit to Elephant Nature Park directly supports the elephants and makes it possible to continue running the park. Sangduen “Lek” Chailert is an amazing woman and she is helping to change the mindset of the tourism industry one elephant at a time. Please take the time to visit the Elephant Nature Foundation to read more about Lek and her incredible work with Thailand’s elephants and how you can help. Talen, what an excellent post. Is there anything about how the baby elephant survived? All I know is that it was hoisted out of the drain, but nothing much after. 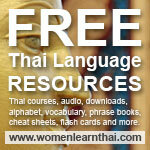 .-= Catherine´s last blog ..Successful Thai Language Learners: Celia Chessin-Yudin =-. Cat, the baby elephant definitely survived but there was little news after the initial accident as to it’s whereabouts or well being. They actually dug the grain out to save the baby and it took a very long time. Talen, although I haven’t visited the park they were recently on satellite TV here in an NGC documentary(filmed 2003). Great programme and a very worthwhile charity. PS your comment luv widget keep saying my feed is “bad juju” whatever that means. Mike, there have been several good documentaries and short films done about the foundation and it’s founder. I don’t know what has been going on with comment luv it’s been acting up all over the net this week. For a while it was linking to a picture in my gallery when I commented anywhere. If they don’t get it together soon I’ll be looking for a suitable replacement. You might try registering with their service that’s what I had to do to fix my problems. .-= Lloyd´s last blog ..Cycling in Phuket, Thailand =-. It breaks my heart the amount of animal cruelty which goes on in the world from mistreating pets, dancing bears and all the other horrors humans inflict on defenceless animals. Thank goodness for people such as Lek who work towards redressing the balance. Talen, like Catherine I took a look at Khun Lek’s website and was most impressed. The site has over 2,000 photographs and having looked at a few of them I’m convinced the young lady would look terrific in a bin liner and a mud face mask. What a gorgeous looking girl and one who is devoting her life to helping elephants at the nature foundation. Anyone can see in your post photo that she has a love and devotion to these mammals that is second to none and your passionate writing tells of your commitment to helping the cause. I’ve seen at first hand the claw like hammers the mahouts use to control the elephants and it isn’t a pretty sight. Good post, one cracking looking lass and a very worthy cause. .-= Martyn´s last blog ..Bangkok’s Mafia Wars =-. I love elephants. It reminds me when I was in Manila. I saw it in Manila zoo he so cute and loving elephant. If we took care the elephant we make sure that he/she is not wild and we should be careful of his/her heavy feets. Thanks for the tips. .-= Anne´s last blog ..Holiday Cottage in Cornwall =-. Talen, thanks for this very interesting post. I had never heard of the Elephant Nature Park before. We get the occasional youngish elephant in Phana begging for bananas and they have walked all the way from Surin. I’ve just come back from Laos where we took a ride on one — now I’m wondering if we should have. The mahout said she was 42 years old and until recently was used for logging. So I guess ahe has an easier life now, and is well used to working for a living. She seemed well treated, I hope so. .-= Lawrence´s last blog ..Falling short of Paradise =-. Lawrence, a lot of the elephants do have much easier lives than when they were in logging. While logging they normally work all day long then they are turned loose to find their own feed after a long hard day which is even harder for new mothers and their babies. The elphant nature park just opened a new facility in Surin as well. Martyn, Lek certainly isn’t hard to look at and you can see the love and passion she has for these gentle giants in her eyes and smile. I think she has been rewarded as much as the elephants have. I still call them hefalumps. .-= Acadia´s last blog ..Ebony Jenkins – 2:09 =-. Pooh to you sir, and good day! You do realize that agreeing with him only encourages him to think more which will lead to you having to do more work and fix more things….dontcha huh?